Peaked Apparel was launched back in 2012, as an online shop, and the creative direction has always been in the hands of Conor Peek. The brand’s signature look lays in an alternative, darker style which commonly involves pop culture artwork as well as typical scene motifs like moons, pentacles, and skulls. Conor Peek’s genuine enthusiasm for this alternative aesthetic is very much conveyed throughout the brand and is clearly contagious. As the Instagram page sits at 11,000 followers, and 76,000 likes on Facebook, with a clear cult following of the brand. As I spoke to Conor, we discussed the future of the brand, its creative inspirations ,and the trials it has faced. One thing Peaked Apparel recognises is the need for harmony and diversity within the alternative fashion market. It could be argued that in the age of social media, it has become easier than ever to discover new styles and a number of independent labels, so people have the chance to be more open and experimental. Brands like Peaked Apparel have responded to this booming sub-culture, incorporating a measure of joviality to traditionally Gothic templates. He says “when I was creating Peaked back in 2012 I wanted to make sure I didn’t fit into one box… I aim to bring out something for everyone be it a moody dark aesthetic or a fun meme inspired design”, thus allowing it to represent a playfulness that is often missing from the mainstream market. Another important thing about Peaked is the communication between their staff and customers. Their Facebook page is incredibly active, both in terms of frequent updates and promotions, but within the comments section. Fans of this brand are passionate about it, and are driven by the understanding that staff respond to a remarkable number of messages, engaging the customer on a personal level and making them feel like a significant contributor to the brand. The topic of creative influences is interesting when looking at Peaked, as the brand is so dynamic. Collaborations are one of the ways in which Peaked Apparel stays ahead of the curve, pioneering projects with people directly involved in other media. Notable projects occurred this summer, when they partnered with Andy Glass from the band We Came As Romans for their ‘Peaked X Glass Collection’. The designs included graphics of snakes and magic, with an overall theme of dark wisdom and wizardry. Conor credits “friendship and a love of their work” for their collaborations. Peaked experienced further success at the start of September, when it was announced that they were launching a physical shop for the first time. Conor is evidently thrilled at this achievement. He told me that it “was always a dream” to get a brick and mortar store, and that he “couldn’t be more excited” to show his plan for the future unfold. As well as his enthusiasm I also detected a degree of impatience, but of a kind that is deserved. For as much as he was able to get things in order, third parties proved an obstacle to his plans and his schedule. “The Uninvited Store isn’t actually open as of yet. We hit so many delays with the building due to previous tenants and the age of the building that it kept getting pushed back but it’s finally nearly ready for the public”. Conor was eager to make it clear that this “won’t be your average retail store”. 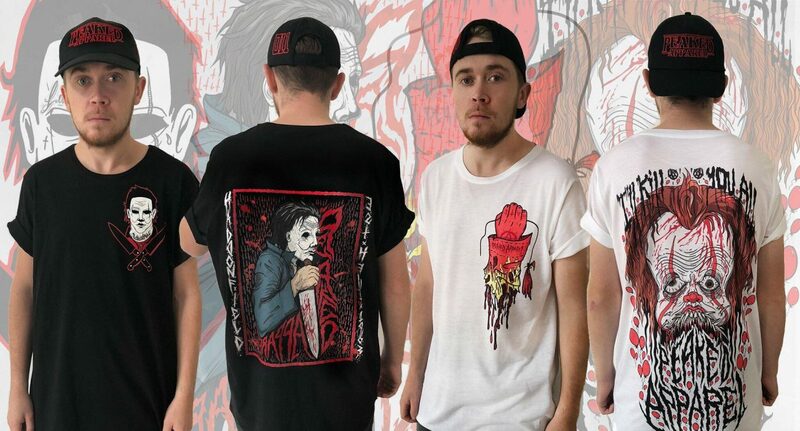 Currently, the brand has just released a new horror-inspired “Icons Collection” with two available prints – Pennywise the Clown, and Michael Meyers from Halloween. Both have their own appeal, and Conor announces his plans to release a “Volume 2” to the collection if anything great comes to mind. With a lot to anticipate in the near future, current releases to take advantage of, and there being no sign of an exhaustion of creative talent, it could hardly be a better time to be a fan of Peaked Apparel and see a success story outside of the typical mainstream.